The Kitchen was one of Arnold Wesker’s first plays and follows on from the Royal Court’s well-received (if not by me) Chicken Soup with Barley in a year which has been something of a revival for Wesker. 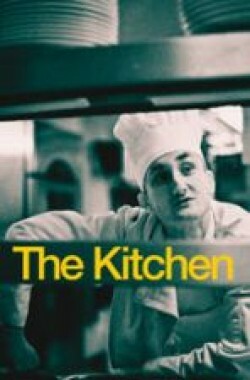 Written in 1959 and inspired by his own experiences of working in the catering industry, it is set in 1957 in the basement kitchen of a large London restaurant, the Tivoli. The dynamics of a swirling multi-cultural mass of chefs, waitresses and kitchen porters are exposed as they slowly build to the mad rush of a huge lunchtime service. Playing in the Olivier at the National Theatre, this was a late preview performance. Director Bijan Sheibani has assembled a cast of 30 who rush about Giles Cadle’s circular kitchen set with increasing fervour as prep turns into service and the banter with all its personal enmities, tribal groupings and rivalries between kitchen staff and dining-room staff becomes increasingly fraught, and of course largely forgotten as the rush passes and the calm of the afternoon allows for a more reflective atmosphere. The less intense evening service provides a final act is no less dramatic though as slow burning stories finally explode. Given it is part of the Travelex season, I don’t know what I was expecting but I did find myself disappointed at the lack of real food on stage! There’s lots of clever sound effects and pans that appear to be bubbling on gas stoves but the ‘cooking’ is all done through mime and not just that, much of the movement of the actors is synchronised, occasionally freeze-framing to allow mini-scenes to play out and then restarting. Matters culminate at the end of the first act in a fully choreographed 15 minute routine at the height of the lunch service, somewhere between a Viennese ballroom and the fanciest wind-up music box. Visually it is stunning but it doesn’t mask the fact that for the first half, little of any consequence has actually happened: the tiniest snapshots into the lives of these workers is all we really get. As the second half begins, the focus ends up settling mainly on the manic, young German chef Peter, specifically his frustrated love affair with the married English waitress Monique but also his relationship, or lack thereof, with the other workers, his over-compensatory behaviour a reflection of how difficult it must have been to be a German out of Germany in the 1950s. To be honest, I wasn’t really a fan of Tom Brooke’s performance here, too self-consciously intense in that I never quite forgot that he was acting a role, something that could improve with time to be sure but it was also rooted in his story not being particularly well fleshed out by Wesker – his approach means that everything is touched on briefly in this replication of a working day rather than being a dramatisation of the issues, the touching relationship between Peter and the Jewish workers being one example that was ripe for further exploration. My attention was drawn more to the sub-plots and some excellent flashes of characters in the large supporting cast: the endearing Katie Lyons as Monique was movingly matter-of-fact about her situation and the abortion issue was one I would have liked to have seen more of; Samuel Roukin is astoundingly good as pastry chef Paul, floundering after being left by his wife and feeling lost in a society that doesn’t seem to reciprocate his innate kindness and Rory Keenan’s Irish chef, thrown in at the deep end on his first day, is replete with quirky yet realistic personality. There’s also good work from Ian Burfield’s grumpy butcher, Tricia Kelly’s redoubtable veg lady Bertha and Siobhán McSweeney’s sweet dessert lady. Altogether I have to say that The Kitchen left me rather disappointed. The cast work hard with very little but the idea of this mini-community being representative of the world of work or industrial relations isn’t one that really works, the play is stronger at suggesting the lives of the working classes in the late 50s in a country still struggling to escape the shadow of the war and in a society still waiting to be liberated by the social revolution of the 60s. That said, it has moments of visual grace, the clever way the orders appear on the main set and the sweeping choreography with its first-act-ending coup de théâtre almost make up for it. Almost. Note: we took our usual cheap seats at the front for this but if you have the chance I would avoid the front few rows. The stage really isn’t raked enough and so you really are better off from about 5 rows back or further. It's a strange play, and, yes, for the first half nothing really happens. There's a few half plots which reman half plots in the second half. The choreography is spectacular, and, without it, the play would sag. The second half, at least, has a narrative trajectory and I found myself warming to the play at last. The temporal representations of a kitchen were drawn perfectly; that melancholy return to work after a few hours off in the afternoon was spot-on. We were sat in the cheap seats in the circle, and from that distance it took awhile to recognise each of the characters lost in a vast set, which needed to revolve rather than stay static. If you view the play as a snapshot of London (like Virginia Woolf's Mrs Dalloway) it works wonderfully. I'm glad you liked it and thank you for taking the time to explain why. It it a long time since I sat in the circle there, it's too far for me to be able to hear/lip-read comfortably, but I guess with a production of this size, you would have gotten a great sense of the whole from there.